A place, sometimes dark like the inside of a hollowed-out tree, sometimes mech like a Hironobu Sakaguchi tale. Dedicated to stories about writing, and writing stories. Posts with stories in the horror genre. 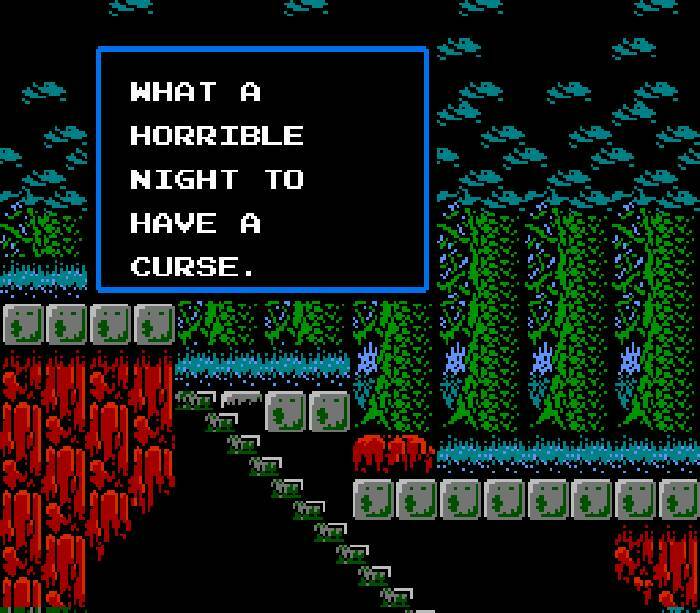 Night falls over Europe, Castlevania II. Copyright Konami Digital Entertainment Co., Ltd.
You find yourself alone inside the House of Words. The cold leather of an old Victorian sofa reminds your thighs they are sore. The stark grey of early morning penetrates the stained glass windows, but someone pulled the library’s thick, crimson drapes shut. Only a lone, flickering candle guides your eyes, its light the color blue. You stand and walk the chamber, patting away the dust from your backpack and khakis. On the desk rests a rusted metal-bound journal and a quill, still wet with midnight prose. ‘To Anne Rice,’ reads the cover. ‘Thank you for inking my twenty-four-year-old mind with your lively fantasies and spirit-bending words. This is one of five. You bite your chapped lips, ignore the thirst and open the book. A field full of color, full of rain. The aroma of endless earth and grass overpowered everything across that New England summer’s day – not her. My father had said, ‘Simon, you must find a mate. You must carry the line.’ The matters of the heart never captivated my interest. The rush of the hunt, and the art of death; those were the thrills for me. And yet, as I lay on the cold hospital floor, trapped behind our hastily constructed barricade, my thoughts swooned to the overflowing life in her face, and the exquisite beauty of her neck. The halogen flickered on and off. Something clawed behind the bathroom door. The din of nail on brushed metal penetrated my ears deeper than my human body remembered. I rose to my feet, turned to the stretcher and watched: Labored breath, faint but there, underneath the soaked, red velvet nightshirt. I crossed the room, limping, but careful not to trip over the bodies festering on the once white and sterile floor. The stench of rotten blood overpowered my nostrils. I exhaled full of concern, balled my trembling hands into fists and kneeled next to her. “Victoria…” the whisper escaped my lips in a far more melancholic tone than intended. She lifted her powerful gaze, hidden behind hazel, glistening eyes; trying, but failing, to draw a smile on her gaunt face. “P-promise me… luz de mis ojos,” she said in her country’s native tongue. More sweat trickled down her forehead. “Promise me you’ll live… both of you.” Her voice still carried the same sweet timbre I remembered from the night of our first union. I pressed a hand to my neck, trying to contain the red liquid. The wretched parasite’s heat had begun its course. A loud bang, like a semi-truck had kissed the walls, interrupted my introspection and whisked away any remaining guilt. Dust floated down the ceiling, flirting with the faint light of night peering through our four-story window. Victoria raised a frail, lanky arm to my face, pushing away my long dark hair, once soft and tempting, but now smeared with the grease of the fight. I peered at the pool of blood gushing out her womb, then at the white-coated cadaver lying next to her bed, silver instrument of surgery still clutched in his hand. Victoria’s reddened eyes opened wide. How befitting, maybe even poetic I thought as I bent down to pry the device off the doctor’s stiff grasp, considering how Shakespearian it would be, even for my murderous hands, to gut my own wife. There are no more happy endings left to write. “Y-you know… what you have t-to do…” she said. I lifted the disinfected tool, forcing my gaze upon her abdomen and inspected the puss-infested gash. I failed to make the first cut. Leave it to the future mother of my child to gift me one last selfless act before forever abandoning me, and this world. Victoria dragged her hands to her open wound and grabbed both sides of her flailing skin. Then she stretched. And pulled, and stretched some more, rupturing both flesh and blood vessels like a savage from the dark ages. She let out one gasp: The final gasp. My face filled with horror, and then rewrote itself in hunger as the smell of rust permeated the air. A cry, and sweet melody to my new ears! My son wailed, beckoning for his first breath of life. I jolted awake from the stupor of dehydration. My human blood fought back against the disease’s pestilence. The tears poured down my cheeks and mouth, as the fatherly love common to all God’s creatures overpowered my new instincts. Was I still one of His? Before I realized it, I was pushing my hands into Victoria’s womb, groping over viscera and flesh. Her arms fell to her sides, lifeless and limp, as if the Creator had designed this new boy to only ever be loved one parent at a time. I lifted him, both freeing him from the fleshy prison, and myself, ever so slowly, from the garden of humanity. Jacob was pale white, or more of a rosy gold, doused with a full head of black hair and covered in blood. Covered… in blood. I held him tight, with trembling lips, trying to say his name, but ashamed to utter the words. Instead I wept and howled as the heaving of grief took my shoulders and chest, shaking me to my bones. I had lost my wife, my one ever true love. Now, I would lose my firstborn. A commanding blast resonated across the room. Two ghastly immortals stood behind me. I turned my head just enough to take in their form. These weren’t your typical infected hominids. I recognized the breed: forged with the stone dust of a gargoyle statue and gifted of life from the Beast. Their wings, when stretched, expanded over a meter wide. Flight offered no advantage inside closed quarters. I knew this. They knew this; thus, they coiled the ebony flaps around their chests, providing additional armor to their already nearly unbreakable skin. They didn’t move, or say a word, barely acknowledging my presence. The insubordination didn’t offend me, but their eyes, their eyes infuriated me the most: no lids, no corneas; life swallowed in shadow and a silence boiling in rage. How I wished for my satchel. Mother’s favorite, the Vitruvian Man, embroidered on the flap. My favorite, the weapons of my own devise, overflowing in the bag. My family’s craft, which I did have, while designed for situations like this, wouldn’t exactly even out the odds. It would have to do. Just like it did the grunts, the irrational, armor-less fools whose remains pestered the floor. I had never faced a Soldier by myself, let alone two. The obsidian helmets and masks of iron black covered everything except the eyes and mouth. I always preferred to go in through the mouth. Not because it offers advantage, but because I wanted them to watch; to witness the glorious moment I banish them to the land of Hell’s Lords. I looked at Jacob and tried to force a smile. I’d have to do the deed with my bloodline’s archaic tools. I removed my shirt and bundled him tight. The Kevlar threads of Aunt V.’s chain mail would provide adequate protection. “The Greymont line ends tonight,” the creature on the right spoke to me in a voice I always thought sounds like a slab of metal against a stone grinder, grinding from inside a hollowed-out tree. My broken leg had fully healed. “Show me the power of the Greymont line.” The accursed demon’s whispers visited my mind for the first time that night; he who had gifted the disease to the lowlife who bit me. I knew then the metamorphosis would soon complete, and I, become a part of him. My father’s whip unfastened from my battle-worn belt, tail hitting the floor with the finite snap of its wyvern scale tip. I took a deep breath, thought of grass, tulips and dreams, and swung. Then the air before me exploded into a black sun. Enjoyed this literary snack? You might also like Star Map. Leave a comment or share with others. Feedback, thoughts and speculation are welcome too.